April 28, 2016 --- An enclosure that eliminates all metal parts, for housing outdoor equipment operating in extremely corrosive operating conditions, is announced by the field instrumentation protection specialist Intertec. The enclosure is made from GRP - glass reinforced polyester - a material offering intrinsically high resistance against the corrosive media and environmental conditions found in many field protection applications. Metal components on the external surfaces of the enclosure can corrode quickly in aggressive environments such as offshore and coastal plants in oil, gas and chemical, power generation and other processing industries. 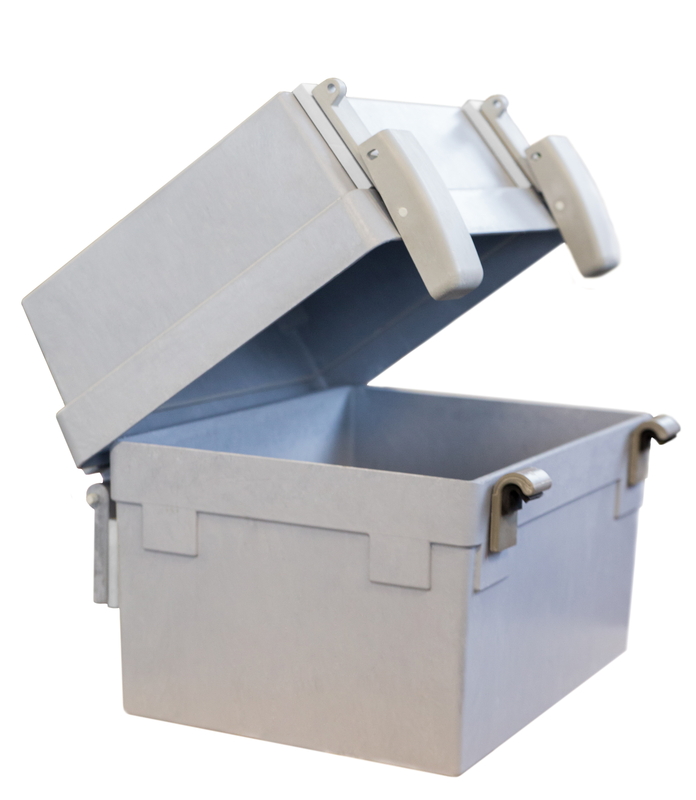 Intertec's field enclosures are made from GRP, but are typically fitted with a number of metal parts such as hinges, clasps, nuts and bolts, made from 316 stainless steel. However, to meet a request from a customer building instrumentation systems for emissions monitoring in a petrochemical refinery, an application that can be exposed to extremely corrosive atmospheres, Intertec has developed a version of its Multibox outdoor enclosure with nuts, bolts, clasps, hinges and other accessories fabricated entirely from GRP. Intertec's Multibox is a two-part, oblong-shaped enclosure that can be mounted vertically or horizontally. It has a deep and shallow section for further versatility of equipment mounting and access, and either of the sections can be used as the door. There are nine standard sizes available providing instrumentation and control engineers with a range of volumes from 25 to 277 litres (0.88 to 9.78 cubic feet). The two enclosure pieces can be fitted with hinges and clasps, or left separate and joined together using only clasps. 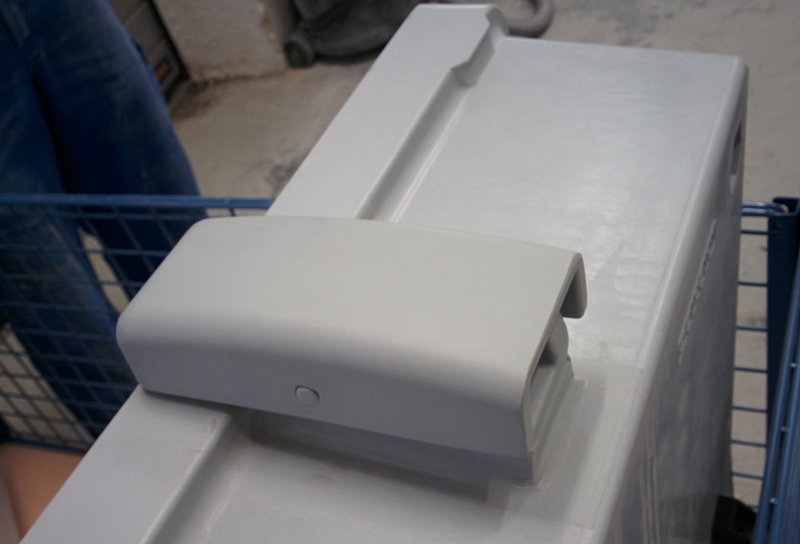 Intertec manufactures its enclosures using high-performance GRP. The GRP sheet material used has a very high thermal resistance compared to metal, with an efficiency that is over 1,000 times better. GRP has proven to be a highly superior structural material for building enclosures to protect field-based instrumentation, control and communications equipment. The main competitive material used in this application sector is sheet metal. Intertec's GRP is produced using long-fibre glass strands which makes it almost as strong as stainless steel, yet around 75% lighter. GRP does not rust or degrade in any meaningful way for this field protection application. Combined with its excellent insulation characteristics, these properties make GRP an excellent choice for the construction of robust outdoor enclosures - allowing maintenance-free lifecycles of 30 years and more. Intertec has been using the technology for over 50 years and can cite many examples of GRP enclosures that have operated for 30 years and more in harsh and aggressive outdoor environments. 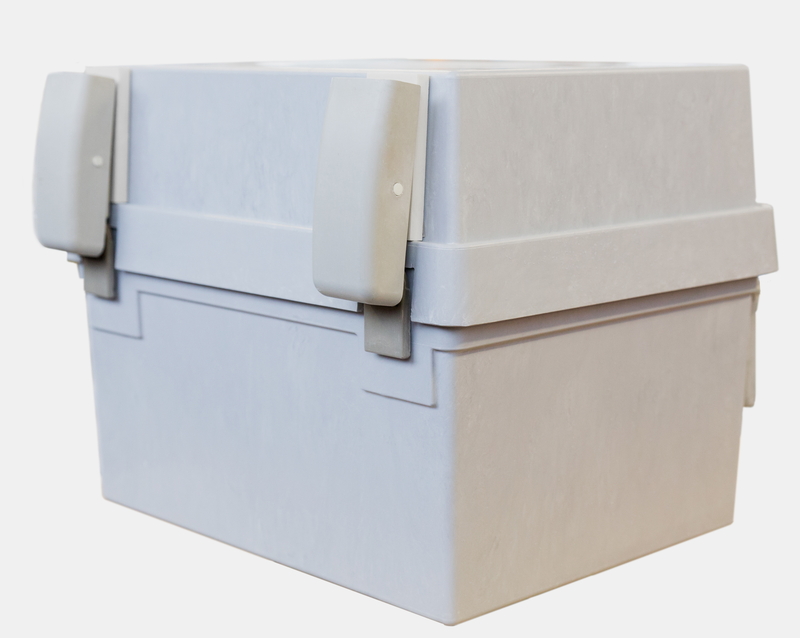 A GRP-based enclosure that eliminates all metal parts, for housing outdoor equipment operating in extremely corrosive operating conditions, is available from Intertec. Intertec has developed a version of an IP65-rated enclosure with clasps, nuts, bolts, hinges and other accessories fabricated entirely from GRP - to suit equipment operating in extremely corrosive outdoor operating conditions.